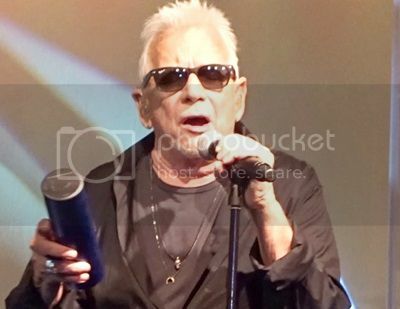 Eric Burdon wailed, cajoled and pleaded his way through 14 songs Friday night, Oct. 26 at the Island Resort and Casino in Harris singing material by the Animals and War. He performed a dozen hits and a couple near misses, backed by a crack six-piece band consisting of guitar, keyboards, bass, drums and a two-man horn section. Burdon launched the evening with a spirited take on singer-songwriter Randy Newman's "Mama Told Me (Not To Come)," a chart-topper by Three Dog Night in 1970. Burdon first recognized the song's potential in 1967 when he recorded the tune for his "Eric Is Here" long-player. The song wasn't a hit. Dressed in black with his trademark sunglasses, Burdon roared through "Don't Let Me Be Misunderstood" and "When I Was Young" No. 15 smashes from 1965 and 1967, respectively. The lyrics to the latter contain the line, "She was brown and I was pretty green," which always made me chuckle. Burdon followed with enthusiastic takes on "Inside-Looking Out" and the ballad "Anything," two more mid-Sixties gems. An entertaining sax solo highlighted "Spill The Wine," which Burdon had recorded with War, his funky back-up band in early 1970. While Burdon spoke mostly to introduce his songs, he chided security at this point saying, "Leave my people alone" to guards who were stopping people from taking pictures in the aisles. Burdon dug deep into his catalog for the next two numbers. "The Fool" was the closing track on the Animals' 1977 reunion album, "Before We Were So Rudely Interrupted." The bluesy "Mother Earth" was another War track, from the LP "Eric Burdon Declares War." The 77-year-old blues singer returned to his glory years, showcasing his hit versions of Goffin-King's "Don't Bring Me Down" and Sam Cooke's "Bring It On Home To Me." "The House Of The Rising Sun," a traditional song arranged by Alan Price, received the treatment it deserved as an all-time monster, with Burdon's emotional vocals up front. The band, born post-Rising Sun, obviously delighted in playing the cut, one of 1964's top sellers. "We Gotta Get Out Of This Place," featuring some tasty keyboards, closed the show. A two-song encore followed. "It's My Life," from the album "Animal Tracks," was joined by "Hold On! I'm Comin'," a cover by the R&B duo Sam Moore and Dave Prater. Like the rest of the audience, I was thrilled with the show. You could argue Burdon was even better than when he recorded all his classic tracks. This was actually the third time my wife Sue and I had seen Burdon, sort of. Back in the day we travelled to Oshkosh to see our idol perform at the annual WaterFest summer concert series. Unfortunately, the show was rained out, although we did get to meet Burdon backstage. The next time we saw him was at the opening concert for the Rock 'n' Roll Hall of Fame in Cleveland in 1995. From our vantage point in the stadium, Burdon was about one-inch tall and was allowed just two songs, paired with New Jersey rocker Bon Jovi.